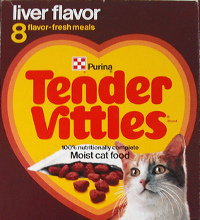 Remember Tender Vittles brand cat food? It was a revolutionary feat of marketing…cat food that bridged the gap between wet, canned food and dry, bagged food. I didn’t think about it until now, but vittles (properly spelled victuals) means “food fit for human consumption”. Was the real purpose of the product to deliver low-cost, low-quality food to humans? It seems crazy. On the other hand, the product was discontinued in 2007 because it contained levels of sugar too unhealthy for cats. That’s what I read in wikipedia, anyway. The following item description seems to disagree. Tender Vittles® contains no added artificial colors or flavors, additives your cat doesn’t need. Plus, it has the great taste your cat loves. So you’ll love knowing that your cat is getting only the essential nutrients he needs, and he’ll love every delicious bite. When it comes to convenience, you can’t beat our easy-serve pouch. It’s a cinch to open and pour and it keeps those delicious, soft morsels moist and tasty so your cat will enjoy every yummy bite from the first to the last. With Tender Vittles, you simply tear open our easy-serve pouch and pour the tender morsels right in the bowl. It’s fast and easy for you and moist and delicious for your cat. With regret we must announce that Tender Vittles have been discontinued by Nestle-Purina. Once our stock is gone we will no longer have them available for sale. Even when I was a kid, I was suspicious of the Purina brand because it made both pet food and breakfast cereal.